Perlick has a revolutionary ball and floating o-ring to prevent beer from being exposed to air. 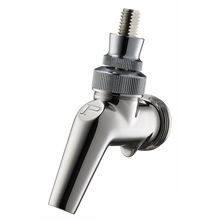 This design results in a handle lever that does not stick and there is no build up of mold or bacteria in the faucet body. The micro-finished interior produces a smooth flow with less foaming, ensuring the perfect pour every time. Better reliability from fewer internal parts. These are easy to clean and can also be cleaned in place to save time.